Have you ever bought a candle thinking “This comes in a really cute jar! I’m totally going to re-use this later to store all kinds of things and be super organized!”? So now, out of all those times that you’ve thought that to yourself, how many of those times did you actually remove the wax and how many times did you just put the burned out candle in a cabinet “to do later”? I’ve typically gone about half-way with it and stuck the jars in the freezer for the wax to harden so I could try to crack it out with a knife. They usually stay in the freezer for about 7.5 months on average. The freezer is fine for plain jars where the frozen wax can just slide right out, but if you have anything funky going on with your jar, you’re going to have to go all archaeologist on it. 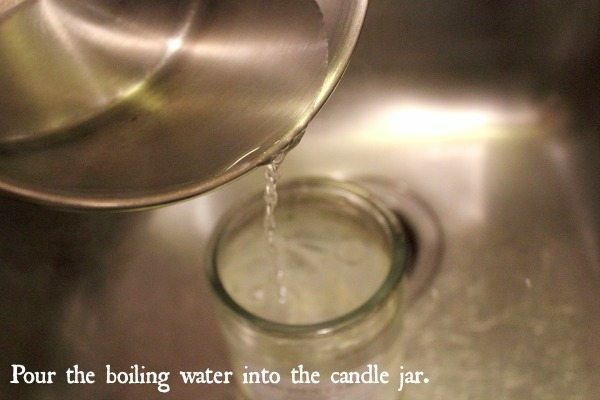 Get a jar from a burned out candle. Does anyone else find it hilarious that this candle is called “Kitchen Clean” and you can see piles of dishes waiting to be put away in the back ground? It doesn’t really even have to a big bowl bowl. Just a small amount of cold water will do. We’re going to melt that wax out! 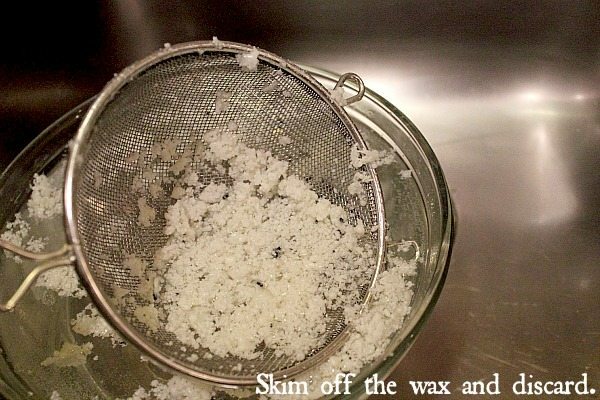 Stir it around a little with a butter knife or something to ensure all the wax gets melted. 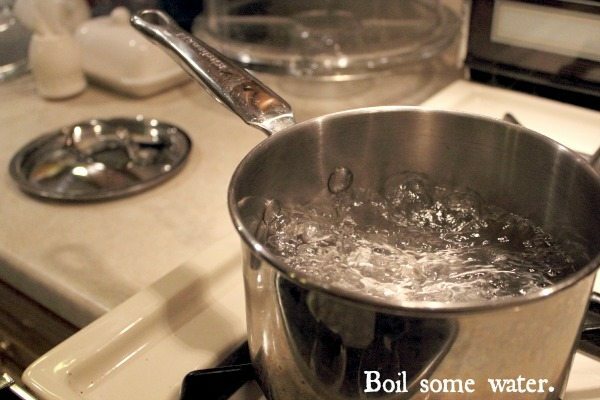 Pour all that melted wax mixed with hot water out and into the bowl of cold water. It separates really easily so if you don’t have a strainer to use for this, don’t worry, a spoon will work just fine. 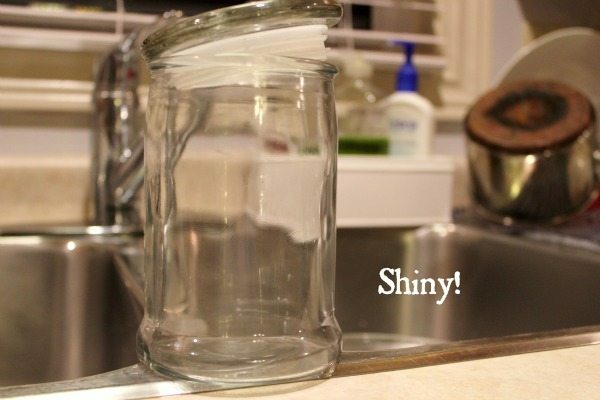 Just a few seconds of work and your jar is perfectly clean! 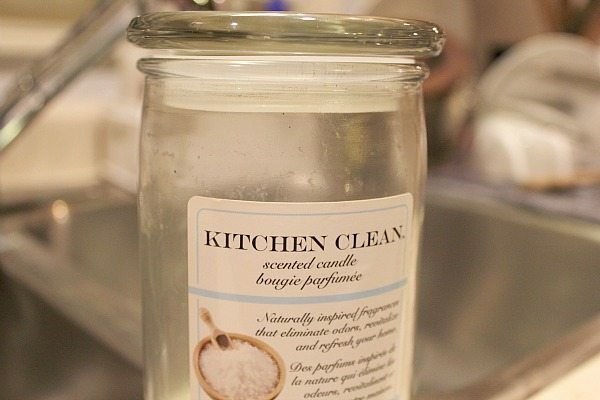 Bonus: Your kitchen will smell amazing instantly if it was a scented candle. Peel the label off and clean your jar as usual. You’re done! Now wasn’t that easy? 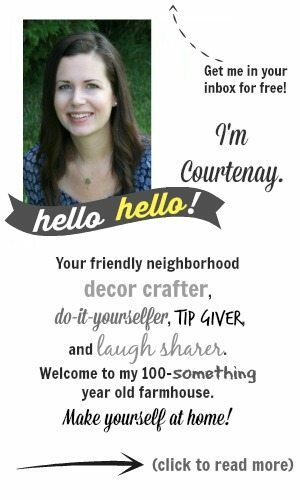 You’re ready to organize, craft or display with your new jar! This is good! I have a bunch of jars with just a little bit left in them I’d love to use for cotton balls and q tips! good thing I haven’t taken the trash out yet! I’m going to pin this do I don’t forget. Thanks for the tip! Great idea! I usually sit and scrape and scrape and scrape. Now I can get those jars cleaned that are stashed in my cupboard! Thanks so much for this tip. I have tons of votive candle holders with melted candles in them that this would probably work great on. I saw your post over at Met Monday blog party. Oh – hey, thanks for the tip!! Well are you just a smartypants? Just think what I can do with all those jars I’ll now have at my disposal! Great tip! Empty jars are always handy for storing things especially with the kiddos! This is a genius idea…way to go girl! You are a genius! I usually scrape it out, then throw it away when I get too aggravated to finish! This method would work, but I think my method is easier and much less messy. Line a rimmed baking sheet with a thick layer of newspaper. Turn the candle jars upside down on the paper. Put into a cold oven and heat to about 300 degrees. Watch carefully. The wax will melt out quickly. 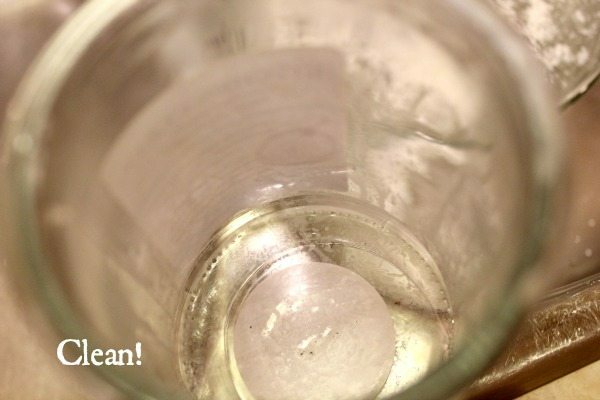 The jars can be cleaned with soap and water and the paper can be discarded … wax and all. No mess…the kitchen will still smell great too. Yes!! I actually use a disposable pie tin. I line it with paper towels and reuse it again and again. Makes my kitchen smell amazing!! Definitely giving this a try. I always do the freezing and then digging process. I like your idea much better. Clever! I’m going to have to try that out. 🙂 I’m always sticking candle jars in my freezer. . . . .Except mine NEVER come out. Again. Ever. Hee! I have 3 jars I’m doing this with tomorrow…first thing! Now why didn’t I think of that 🙂 I’m going to look closer at my candles! Absolutely practical and genius tip! I was just debating how to clean out a candle last night! Thanks so much. I totally needed this tip today, Thanks! Great tip Thanks!! many jars that I would have saved knowing this…. Oh this is very helpful! I can finally use all those candle jars i’ve kept. Thanks! Oh great! I have a bunch of candle jars that need cleaning. With the tips here, they can finally be of great use for other things. Thanks! This is just so “stupid easy.” I don’t know why I didn’t think of it. Haha! 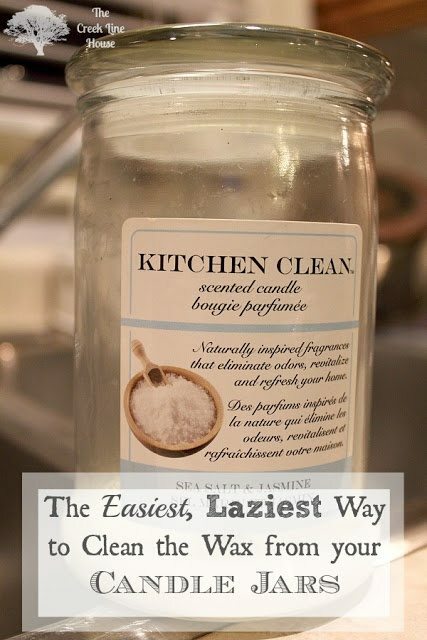 This worked beautifully for a candle jar I’d had in my freezer for 3 months! Question though – is there a way to keep the tops of the jars from becoming all black? I have a large jar candle that I’m buying now, but the top is all black, so I can’t save it. Is there a way to avoid that happening? Thank you! Saw this on pinterest and thought “Finally”! So glad to have this knowledge! Thanks for sharing. All I do is put it in the microwave for a few seconds then wipe it out with a paper towel . Now you need a tutorial on cleaning the wax off of that strainer. I find it just shakes right out into the trash because the wax is already hardened and formed into little chunks before it touches the wire mesh! Although this seems to work well, it looks a bit messy having to strain out the wax. 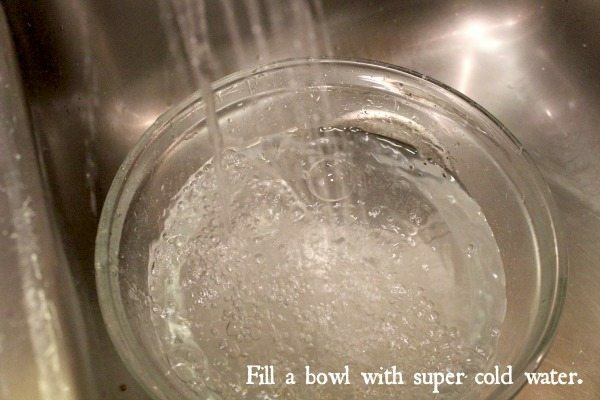 I have been successful by simply placing my candle jar into a pan or bowl of hot water and letting it warm the wax a bit. I take a knife down along the wax inside the jar and the whole chunk of wax usually pops right out. This is an old post, but I thought I would comment anyway! Another way to clean out those jars, and reuse the yummy smelling wax as well, is to place the old candle on a candle warmer and when the wax melts down pour it into another jar that has been prepared with a wick in it. 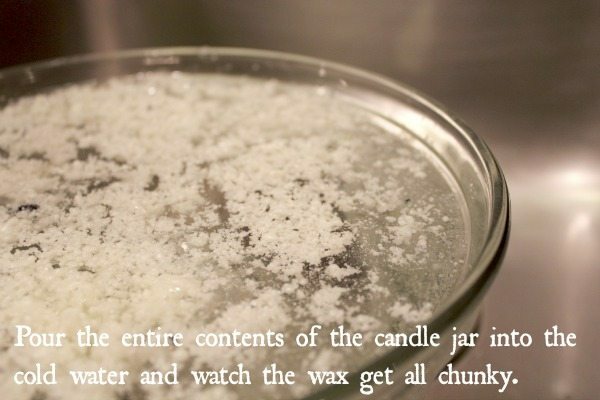 I do this with all of my old candles so I can enjoy the scent as long as possible! Other than jars do you know of any way to get those waxy smears off flat things like a mirrored tray or candlesticks. I just put the jar in the freezer ten pop out the frozen candle wax. Comes out nice and clean.